PCE Automation Ltd has developed a new automated packaging system for RPC Promens Industrial Rushden, which offers customers better tray integrity and greater flexibility in the choice of pack formats while maximising throughput. The PCE Smart Packer has been exclusively designed for RPC. 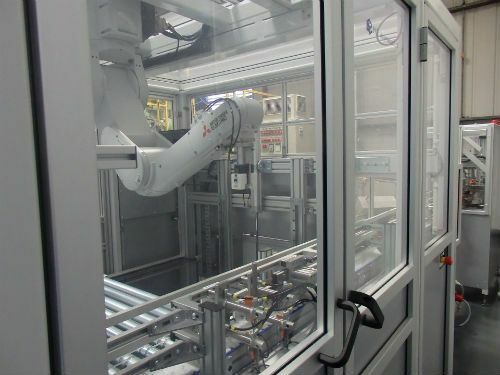 It can run multiple tray sizes, bottle designs and packing formats, and can be programmed to handle any number of bespoke packaging configurations, while its multi-axis robot reduces the number of tray variants required. The PCE Smart Packer can run at maximum line speeds of 1,000 bottles per hour, packing bottles in any orientation, including mixed formats within a single tray with no bottle rotator required. Workflows are further optimised by rapid changeover times from as little as five minutes. The combination of fast throughput and greater flexibility enables RPC Rushden to offer customers an enhanced fast-response service in fulfilling their orders. The trays are also better prepared for the distribution chain as they are fully assembled before use rather than having the final tabs inserted after containers are swept onto them, thereby increasing their integrity and sturdiness. “We are delighted with the performance of our new Smart Packer,” comments Carl Boniface, RPC Rushden’s Technical Development Manager. To see how PCE Automation Ltd can help you develop bespoke automated solutions for your company, email info@pce-automation.co.uk or call 01502 713287.